Welcome to the worlds greatest guide to Women's Leather Shoes. Are you actually looking for Women's Leather Shoes? Well, we hope you are because the reality is that you have found our Women's Leather Shoes page. Apparel Search is a leading guide to fashion, style, clothing, glam and all things relevant to apparel. We hope that you find this Women's Leather Shoes page to be helpful. Indulge in the lasting look of luxury with a fabulous new pair of shoes. A women's shoe is essentially a covering for the foot, which is commonly made of leather. A ladies shoe should typically have a sturdy sole and would not be reaching above the ankle. If it reaches above the ankle, it would still be "footwear", but no longer technically a shoe. Possibly you have heard about leather boots. 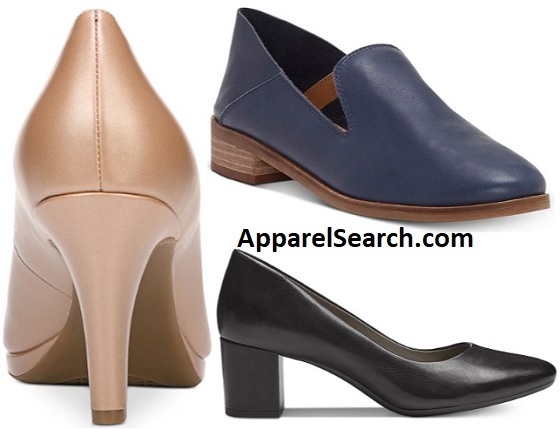 Women's leather shoes come in a very wide assortment of style options. To name a few, ladies leather shoes can be sandals, sneakers, boat shoes, clogs, dress shoes, etc. You can learn more about various shoe styles in our terminology section. Leather is a material made from the skin of an animal by tanning or a similar process. Learn about the various types of leather grain that can be used for women's shoes. Leather is a natural durable and flexible material created by tanning animal rawhides and skins. The most basic foot protection, used since ancient times in the Mediterranean area, was the sandal, which consisted of a protective sole, held to the foot with leather thongs or cords of various materials. By the 1600s, leather shoes came in two main types. 'Turn shoes' consisted of one thin flexible sole, which was sewed to the upper while outside in and turned over when completed. This type was used for making slippers and similar shoes. The second type united the upper with an insole, which was subsequently attached to an out-sole with a raised heel. Originally, shoes were made one at a time by hand. Traditional handicraft shoemaking has now been largely superseded in volume of shoes produced by industrial mass production of footwear, but not necessarily in quality, attention to detail, or craftsmanship. Shoemakers may produce a range of footwear items, including shoes, boots, sandals, clogs and moccasins. Such items are generally made of leather, wood, rubber, plastic, jute or other plant material, and often consist of multiple parts for better durability of the sole, stitched to a leather upper. In modern times, although shoemakers still exist, modern machinery are used to manufacture women's leather shoes. Die cutting tools to cut the shapes and grommet machines to punch holes for lacing. What are patent leather shoes? Patent leather is a type of coated leather that has a high-gloss finish. In general, patent leather is a fine grain leather that is treated to give it a glossy appearance. The coating process was introduced to the United States and improved by inventor Seth Boyden, of Newark, New Jersey, in 1818, with commercial manufacture beginning September 20, 1819. Boyden's process, which he did not patent, used a lacquer coating that was based on linseed oil. Modern patent leather usually has a plastic coating. Although it was in the USA in the early 1800's it was earlier spotted in Europe. An early reference to patent leather is in the 1793 British periodical The Bee, or Literary Weekly Intelligencer, which notes, in an article entitled "Hand's patent leather", that "a gentleman of the name of Hand" in Birmingham, England, obtained a patent for preparing flexible leather having a glaze and polish that renders it impervious to water and need only be wiped with a sponge to restore it to its original luster. What are bespoke shoes? Bespoke shoes are shoes made especially for a certain customer by a shoemaker. The feet are measured and a last for each foot is created. At the fitting, the customer tries the prototype pair of shoes made in an inexpensive leather and the shoemaker checks if anything needs to be changed. If so, the changes are applied to the lasts and the shoes are created with a precious leather. After the final lasts are created, the customer can order more pairs of shoes without more measurements and fittings. You may want to learn more about women's leather sneakers as well as leather boots. Learn about additional categories of ladies footwear from the links below. What ever type of shoe you are wearing stylish as far as we are concerned. You have always been a trend setter. If you want to be even more stylish, you should wear your Women's Leather Shoes.